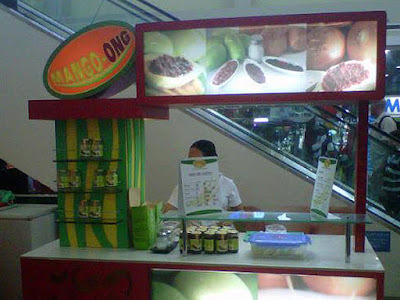 Spotted by Fred of The Exaggerated Zeal in SM City Cebu. 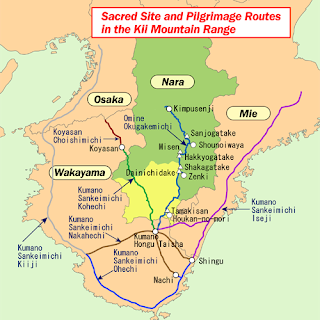 These prefectures, except for Osaka, has at least one site inscribed in the UNESCO World Heritage list. The nerd in me wishes to see all these sites (including all the others sites in other regions in Japan). Except the pilgrimage routes which I don't think my knees will be able to endure. Learn from your mistakes they say. Learned from my mistake I surely did. After that Where is Bentencho Station experience I was more careful with my train commute in Osaka. Especially on my last ride (which is to Kansai Airport). Because, one, I was lugging two bags (one duffel bag and one backpack); two, I was alone (somehow getting lost alone is more daunting); and three, I could not afford to miss my flight home. I waited near the back end of Platform 1 of Osaka Station for the Kansai Airport Rapid Service. The train arrived right on time and I saw a train car with the letter S on a blue square rumble by so I knew it was the right train. But when the train stopped, the train car that stopped in front of me didn't have the blue sign, but a yellow sign with the letter R. Did my eyes deceive me??? I thought I had the Osaka train system down pat?! There was a station staff nearby and I hurried towards him to ask if this was the train headed for Kansai Airport. He told me to hurry to the front end, to any of the first four cars, those cars were going to Kansai Airport. I thanked him and half ran towards the first four cars. Inside car number two, I kept checking the digital screen and listening for announcements to make sure I was really on the right train. 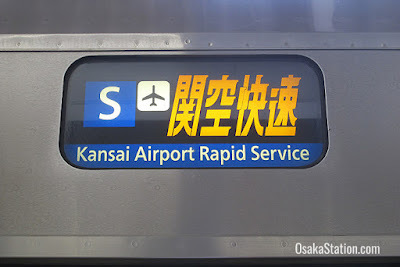 I learned, through the constant announcements, that the first four cars made up the Kansai Airport Rapid Service, obviously bound for Kansai Airport, and the last four cars made up the Kishuji Rapid Service bound for Wakayama. These two Rapid lines would uncouple at Hineno Station. Had I not noticed the yellow R sign on the train car that had stopped in front of me, I would have found myself in Wakayama an hour later! That would have been a disaster. Hyogo, Japanecdote: Am I an Alien? Osaka, Japanecdote: Where is Bentencho Station? On the last day of our trip, we all went our separate ways: one was leaving on a morning flight, two were extending their stay and going to Nara, and I was left alone to wander around Osaka until my night flight. Thus the stupid title of this blogpost which is a play on Bisaya words: Usa ka adlaw, usa ka ako sa Osaka. In English, literally: One day, one me in Osaka. Haha! Armed with only a small Osaka travel guide with printed maps (for this trip I didn't have a pocket WiFi, and because we had already checked out of our Osaka Airbnb apartment, I couldn't use the pocket WiFi anymore), I said goodbye to my friends and thanked them for a fun trip. I then took the JR Loop Line from Bentencho Station to Osaka Station where I deposited my bags in a coin locker. Then hopped on a JR train (I planned to take only JR trains as this was also the last day of validity of my JR Pass) to Osakajokoen Station. 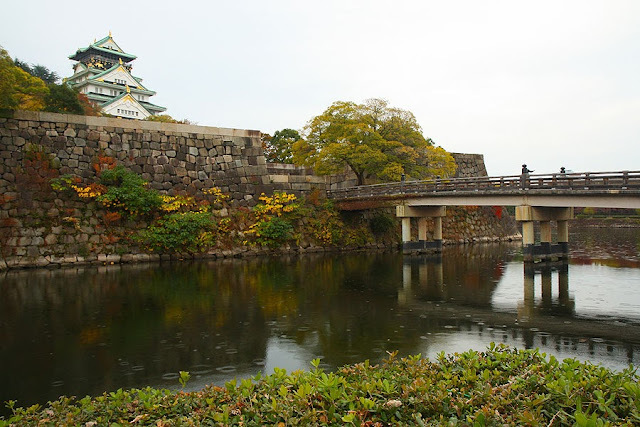 From Osakajokoen Station, it was a couple minutes leisurely walk to Osaka Castle. 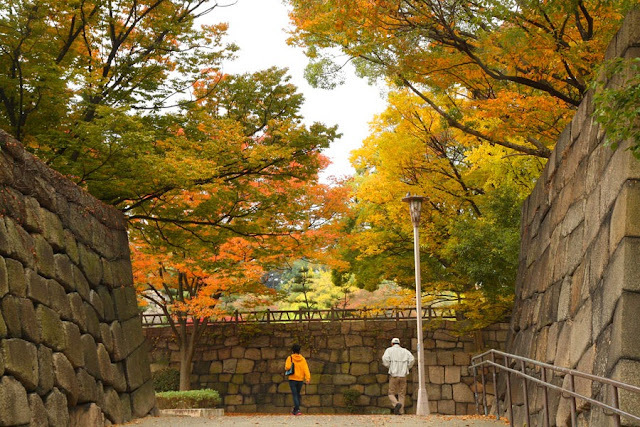 It was November 7, autumn, and the trees around Osaka Castle Park were a beautiful mix of green, yellow, orange, and red. I slowed down my pace. But still I arrived before the castle doors opened. Which is good because I saw there was already a queue. 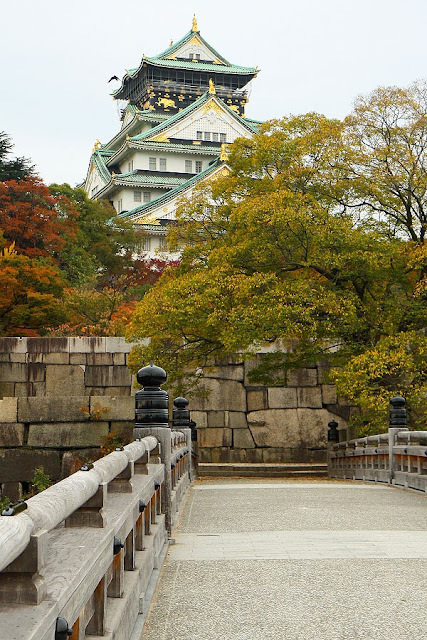 Osaka Castle was built in 1583, but the present-day castle is a reconstruction, built in 1931. 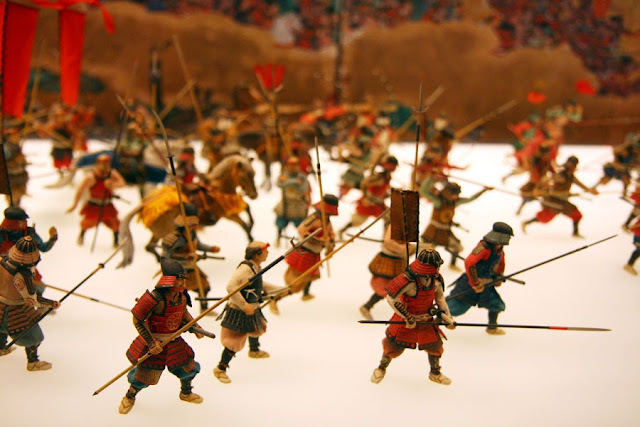 Today the castle serves as a museum. I paid the 600-yen admission fee through a ticket machine and started exploring the castle/museum from bottom to top. 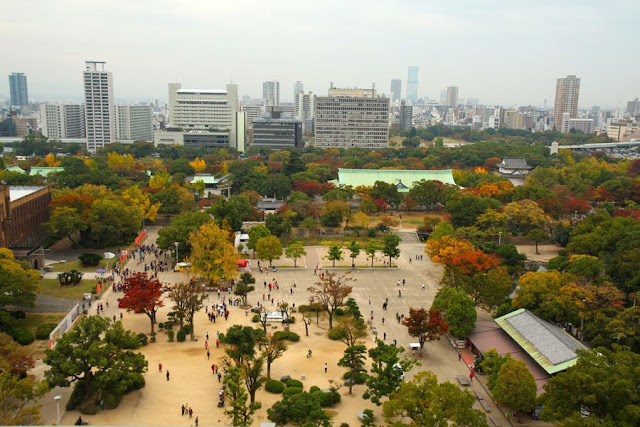 The first two floors are about Osaka Castle. The 3rd and 4th floors (no photography allowed in these floors) are about Toyotomi Hideyoshi, the big gun who ordered the construction of Osaka Castle. 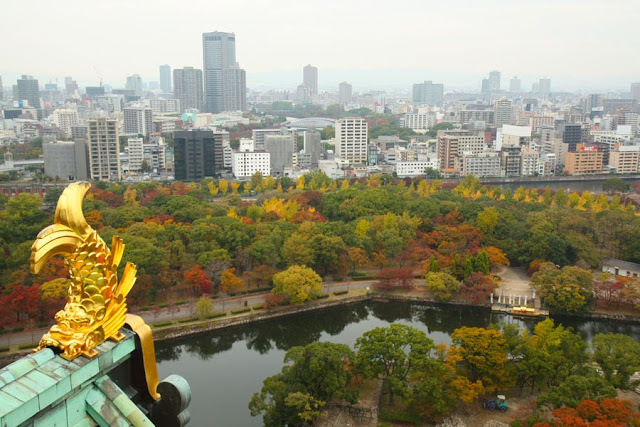 On the third floor, one can find a full-scale replica of Hideyoshi's Golden Tea Room where everything, the room and the tea utensils, is in gold. The fifth floor exhibits scenes from the Summer War of Osaka. (The sixth floor is closed to the public.) 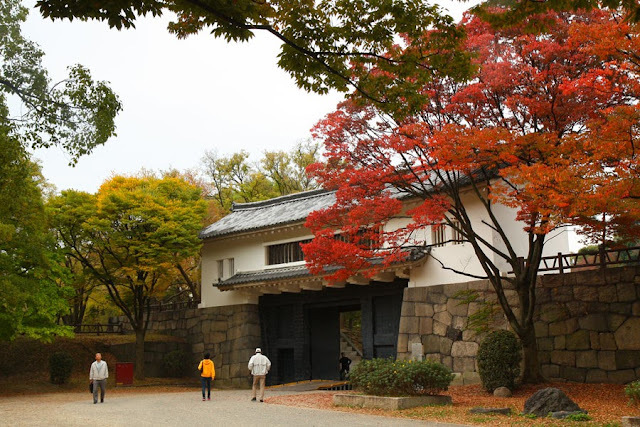 The seventh floor tells about the life of Toyotomi Hideyoshi. And the eighth floor is an observation deck. 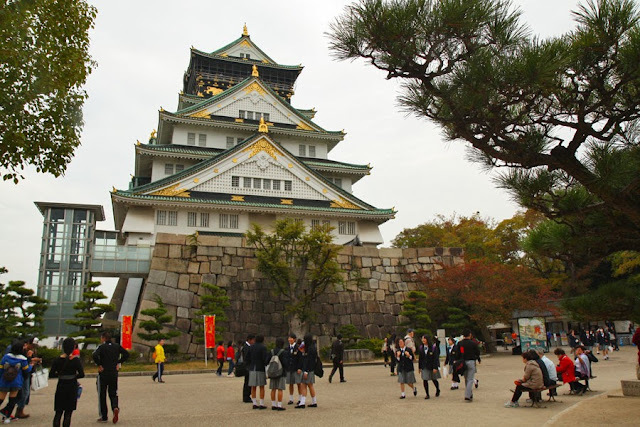 After browsing five floors of exhibits and admiring the 360-degree view of Osaka City from the topmost floor, I exited the castle and spent some time people-watching around the castle grounds. 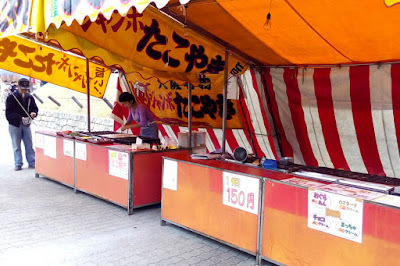 I traced my way back to JR Osakajokoen Station passing by food stalls, one setting up, the others empty. 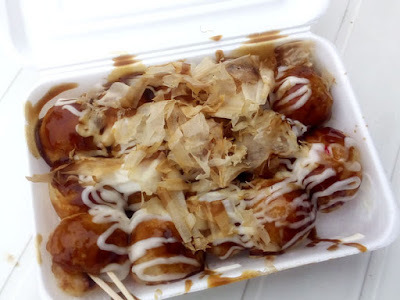 I wanted to try takoyaki (octopus balls) and was happy to find one ready for the eating just before I reached the station. I still had a few hours before my flight and I looked at my map to see if there was anything interesting nearby or along a JR line. 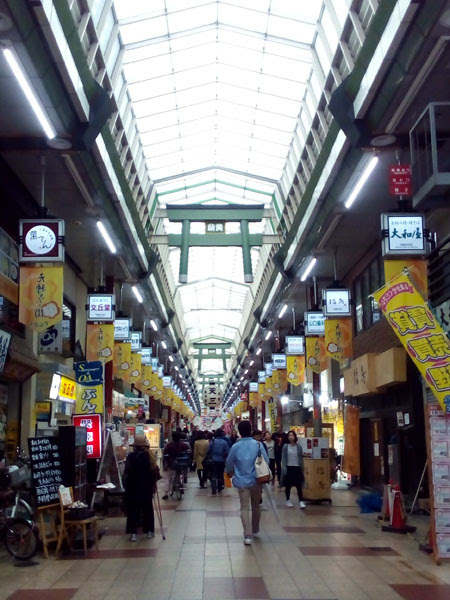 I saw Tenjinbashisuji Shotengai, Japan's longest shopping street running 2.6 kilometers, just two stops from Osakajokoen Station. I don't like shopping but I decided to check it out anyway. Directions to Tenjinbashisuji Shotengai: Take the subway to any of these stations: Tenjinbashisuji 6-chome Station, Ogimachi Station, or Minami-Morimachi Station. Or take the JR Loop Line to Temma Station or the JR Tozai Line to Osakatenmangu Station. Tenjinbashisuji Shotengai stretches southward from Tenjinbashisuji 6-chome Station to Tenjinbashi 1-chome. 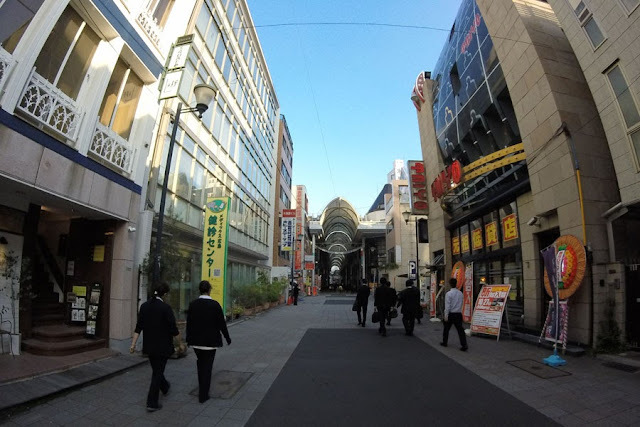 I entered the shotengai (shopping street) at JR Temma Station, at about a third of the shopping street's length. 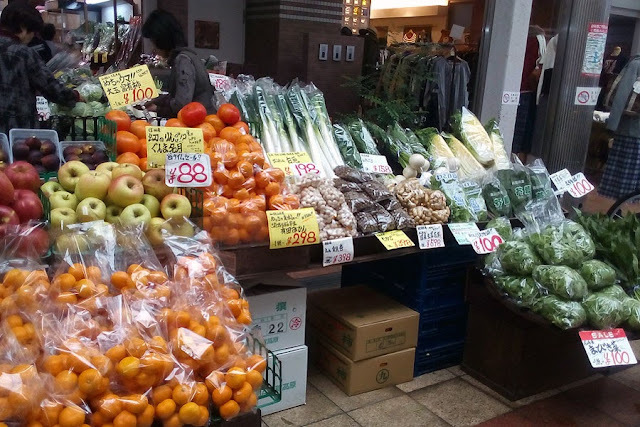 I walked southward where I saw shops of almost every kind: shops selling clothes, shoes, groceries, souvenirs, fruits, vegetables, candies. The entire length was covered by a translucent roof, protecting the shoppers from the elements and at the same time allowing enough light in. One was bound to get hungry if he were to walk from end to end. 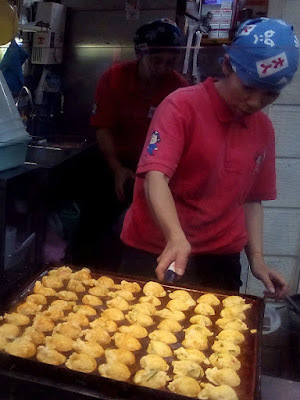 But that is of no great concern, the shotengai had restaurants and food stalls every few meters. 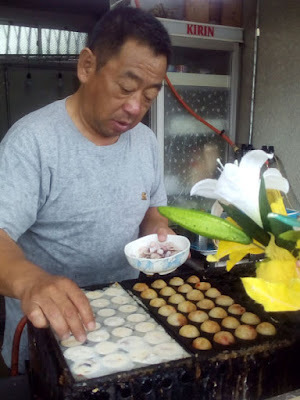 I had just eaten a bunch of takoyaki and all I could do was admire and drool at the food being cooked at every few dozens steps. At about half a kilometer, I decided I've had enough of window shopping and drooling at food stalls and went back to JR Temma Station. Little did I know that this solo wandering was a precursor to a solo Kansai trip that would happen in a year. 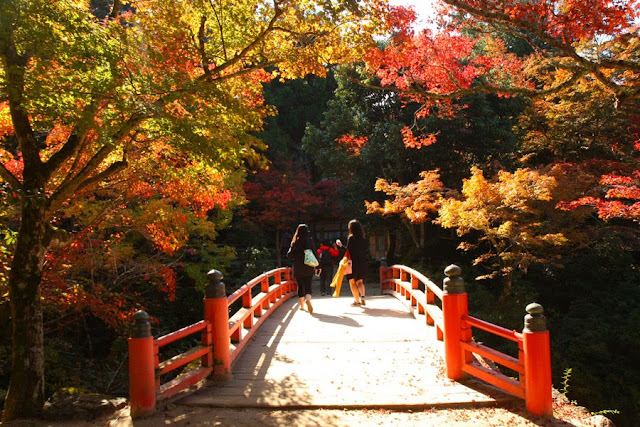 Japanecdote: Where is Bentencho Station? On our first night in Osaka we lost our friends...and eventually found them. When we were together at last, we continued on our journey to Bentencho Station, to find our Airbnb apartment. We queued at the platform for the JR Osaka Loop Line and got on the first train that stopped. 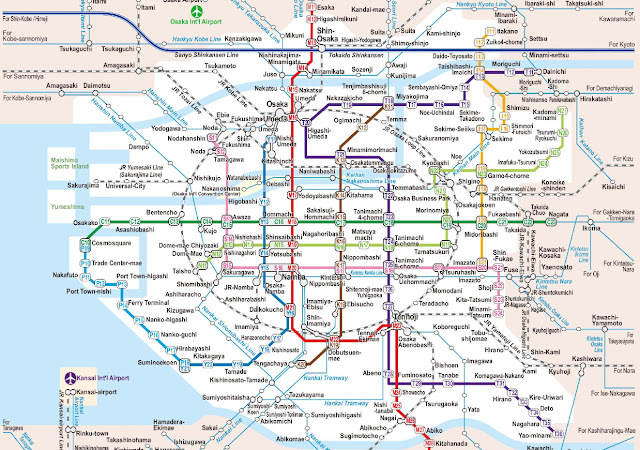 I counted the number of stops on the printed subway map that I had obtained from Osaka Station and told my friends that we should get off at the fourth stop. Got off on the fourth stop we did then proceeded to exit the station. In the deserted sidewalk under the dim light of a lamppost, we studied the directions and photos our host had emailed us—it looked different. One of us checked his offline GPS map—Bentencho Station was nowhere to be found. And it dawned on us: we were not in Bentencho Station! We headed back inside to check the station name: Ajikawaguchi Station. Not Bentencho Station. Although we had queued in the right platform, we had boarded the JR Yumesaki/Sakurajima Line not the JR Osaka Loop Line. 1. In Japan, different train lines might share a section of a track and, therefore, a platform. Be sure to check the digital board or the train name before boarding. 2. Inside the train, listen for announcements or check the digital sign (if there is one; some trains in Japan don't) that announces the next stop or check the route map located above the car doors. 3. If you didn't do number 2, as soon as the train stops check the name of the station or station code through the window (if you can see it). 4. And if you still didn't do number 3 and have exited the train, before you exit the station, look around and check for the station name. These are where I stayed in in Osaka. In 2015, an airbnb apartment. In 2016, economy hotels. All three are near subway stations. 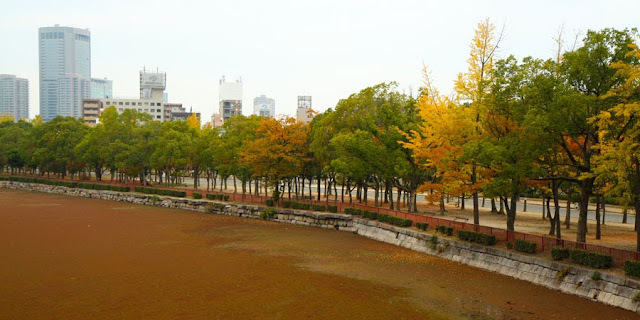 My trip in November 2015 was with three friends and Osaka was our homebase for our last two nights in Japan. We stayed in an Airbnb apartment at Minato Ward, near Bentencho Station. Bentencho Station has no elevators and we had to climb up and down stairs lugging our heavy bags. The apartment was very clean and well equipped. Everything you'd need in your own house: stove, refrigerator, microwave, cooking and dining utensils, dining table, TV, washing machine, hangers, towels, soap, shampoo, air conditioner/heater, and WiFi (portable). We had futons for beds—when put away, the apartment became spacious. The toilet and bath were separate which, for a group of four, was a plus. For a little over 15,000 yen for two nights (minimum stay) for four persons, this apartment was a steal! I stayed in Hotel Raizan in November 2016. 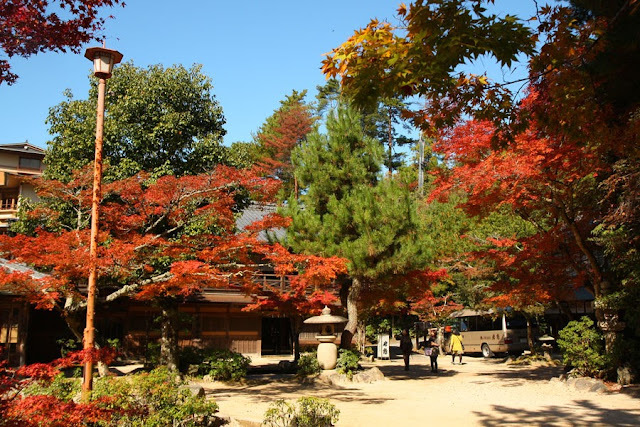 Since my flight arrives at night and I was to travel to Mt Koya in the prefecture of Wakamaya early the next morning, I picked a place where I didn't have to make too many transfers going there and going to the next day's destination. The areas near Namba Station and Shin-Imamiya Station would be perfect: the Nankai Airport Line and the Nankai Koya Line stop in both stations—no transfers needed to/from airport and to/from Koya! A friend of mine who had lived in Japan for eight years and had traveled to Osaka suggested business hotels under the Chuo Group for inexpensive but clean accommodations. There were five such hotels near Shin-Imamiya Station. My first choice was to book Hotel Chuo, but it was full. I picked Hotel Raizan instead. Hotel Raizan is an old (more than 10 years) and simple hotel. On the ground floor are the reception area, kitchen, dining area, luggage storage, public bath (one bath, specific schedule for each gender), shower rooms, and laundry area. Rooms are in the upper floors (there is also a Women Only floor). All upper floors have shared toilets, but no shower rooms. Everyone must go to the ground floor for the shower rooms. I stayed in a Western-style single room (there are also Japanese-style single rooms). 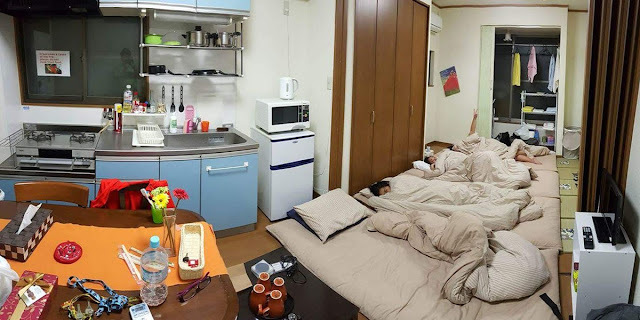 The room had a bed, air conditioner/heater, desk and chair, small TV, and small refrigerator. Bath towel, face towel, toothbrush, robe, and slippers were provided. It was clean but small (space was really just enough for one person). 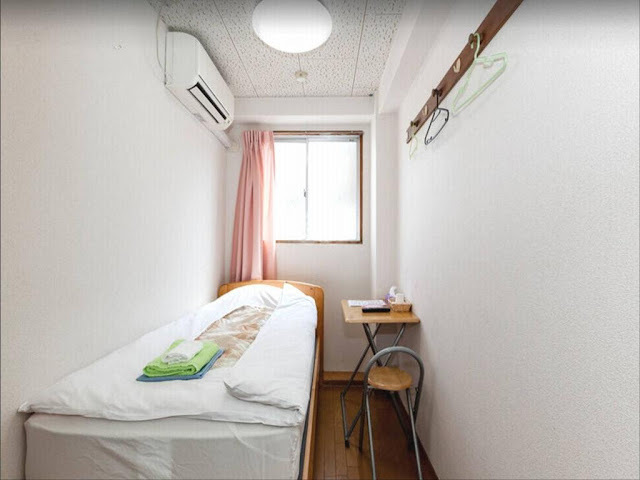 If you have a large bag and will need to rummage through it often, I suggest booking the Japanese-style single room where you can fold and keep your futon to one side and will instantly have more space. The room price does not include breakfast, but there are some food items for sale at the lobby (cereal, milk, yogurt, noodles, etc). There is free drinking water, coffee, and tea in the kitchen. There are also convenience stores nearby. They have a luggage storage area, but it is in an open space (if you are uncomfortable with this arrangement, you can leave your bags in coin lockers in Shin-Imamiya Station). They were kind enough to let me leave my bag overnight even if I wasn't going to check in again. Bonus! 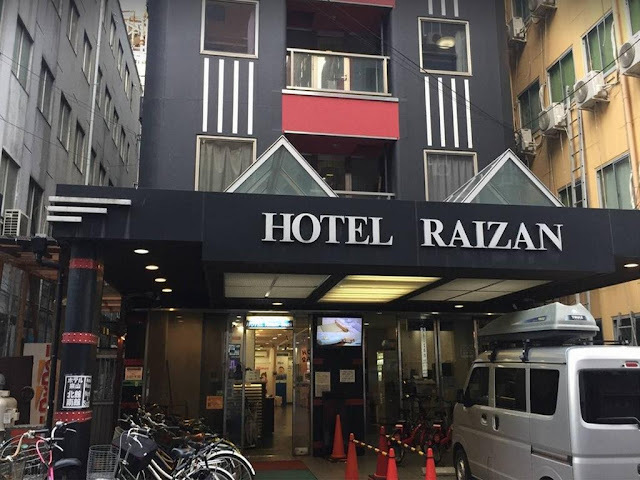 Hotel Raizan sells discounted Nankai Tickets to Kansai Airport. 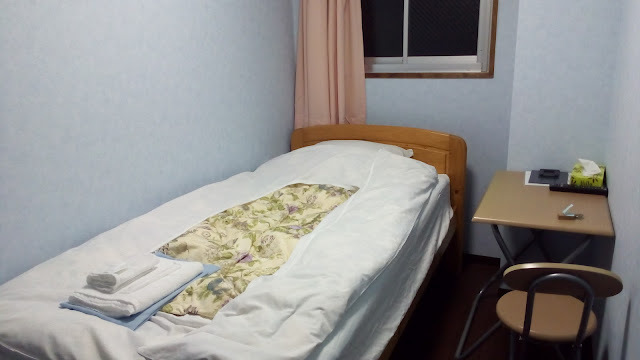 Single rooms start at 2400 yen. * Hotel Raizan South and Hotel Raizan North are one and the same; North/South just means the wing the room is on. The last day of my Kansai Trip in 2016 was spent in Osaka. I picked the same location as when I arrived: near Shin-Imamiya Station. 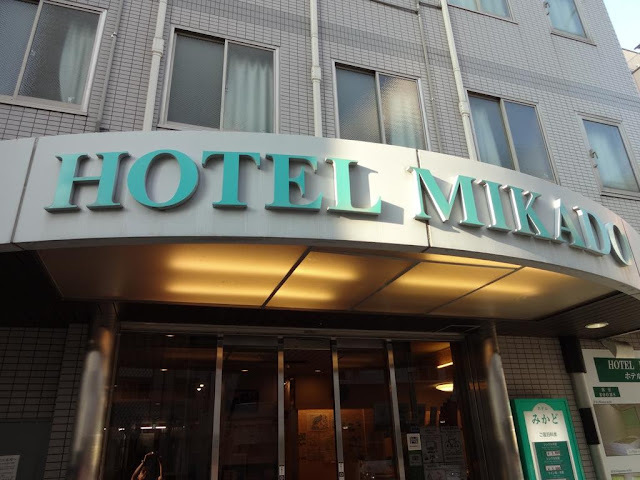 I decided to stay in another Chuo Group hotel: Hotel Mikado, just 50 meters from Hotel Raizan. Hotel Mikado is set up in the same way as Hotel Raizan. All rooms are on the upper floors, each floor has common toilets. All shower rooms and public bath, along with the laundry area, kitchen, and dining area are on the ground floor. Hotel Mikado's rooms have the same amenities as Hotel Raizan's. They also have a Women Only floor. What you can expect in Raizan, you can expect in Mikado too. Even the discounted Nankai tickets to Kansai Airport. And like Hotel Raizan, Hotel Mikado can also keep your luggage for you. But at Raizan they keep it in a closed area near the reception. Twin rooms start at 4400 yen. From Himeji, we took the shinkansen to Shin-Osaka Station where we arrived during rush hour. After retrieving our bags from the coin lockers, we went to the platform and waited for the train that would take us to Osaka Station. We didn't notice until the train had arrived and there was a rush of women pouring out that we had queued at the section where the Women Only car was to stop. Our lady friends took their places in the comfortably uncrowded Women Only car and we, men, scrambled to the next car where we squeezed in with the Japanese salarymen. 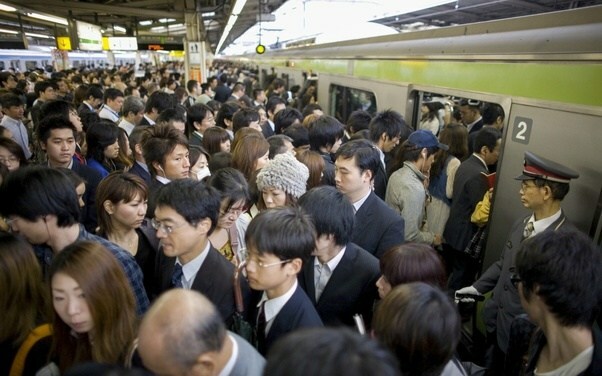 As soon as our train arrived at Osaka Station a sea of commuters flowed out from our train and from the train on the opposite track, then more commuters ebbed into the trains to take our place. We were carried along by the hurrying commuters and I craned my neck to try and find our lady friends. It was like trying to Find Wally. Worse, the friend I was with had forgotten to bring his eyeglasses. We decided to wait by the exit turnstiles in the hopes that the ladies would go there. I tried finding a free WiFi spot. Minutes went by but no lady friends nor could I contact them through WhatsApp/FB Messenger. This was to be our first night in Osaka and we were on our way to check in to our Airbnb apartment. I wasn't sure if my two friends had the address for the apartment (we have to take another train to get there). I told my blurry-eyed friend not to move while I tried to find the girls. I went back to the thankfully now uncongested platforms (the trains have just left) and scanned the lines of people. Just as the next train was arriving I spotted the girls and ran to them. What was the girls' side of the story? Turns out that as I was craning my neck to look for them in the sea of commuters, they had waved at us and had assumed we had seen them. 1. If you and your friends have to take the train during rush hour, stick together. 2. It pays to have a pocket WiFi. 3. Do not forget your eyeglasses. 4. If you find your travel buddies annoying and want to get rid of them, do the opposite of the first three items. 5. It really is very difficult to Find Wally. The afternoon of our ninth day in Japan was dedicated to remembering the past by visiting the city of Hiroshima. 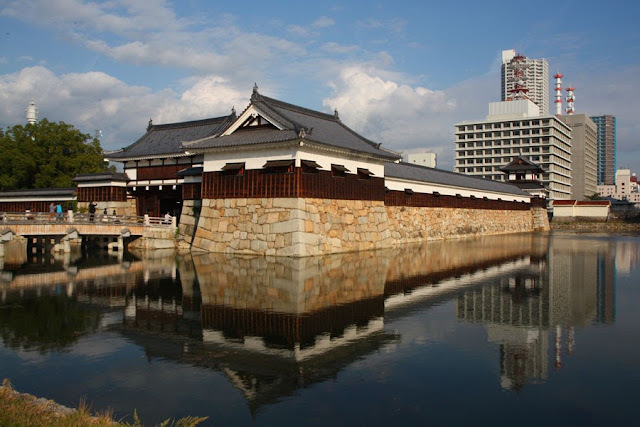 Our first stop was the Hiroshima Castle, nicknamed the Carp Castle. 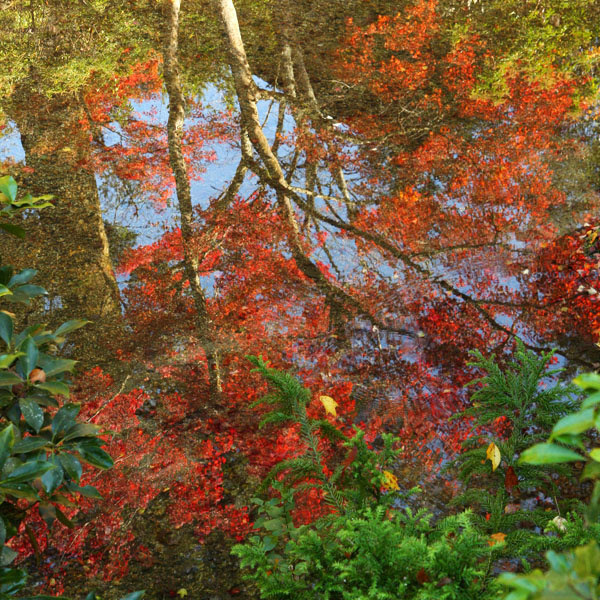 The castle stands in an area that used to be called Koi-no-ura, which means Carp (Koi) Sea Shore, hence the nickname. 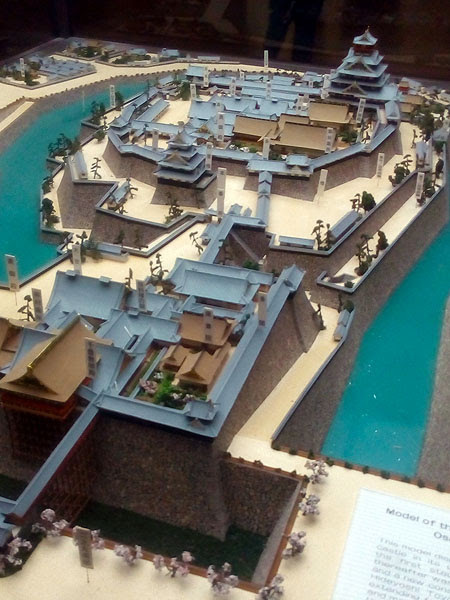 Like all castles, Hiroshima Castle is surrounded by a moat. The castle tower that stands now is a reconstruction (the original was destroyed in 1945). The castle is five stories tall and is now used as a museum. 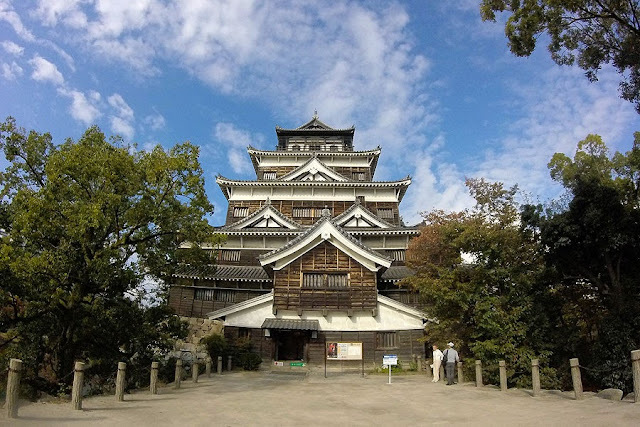 The first floor is mainly about Hiroshima Castle; the second floor is about life in the castle town, including replicas of a tea house, a merchant house, and a samurai house; the third floor displays Samurai weapons and armours (the most interesting exhibit for me); the fourth floor is for exhibits about Hiroshima's history and culture; and the fifth floor serves as an observation deck. Taking of photos inside are only allowed in few select areas (like the area where you can dress up as a samurai). If you listened to your history teacher (or even if you didn't, I am sure you have picked up this fact some time in your life), you know that Hiroshima was where the US dropped the first atomic bomb in August 6, 1945. 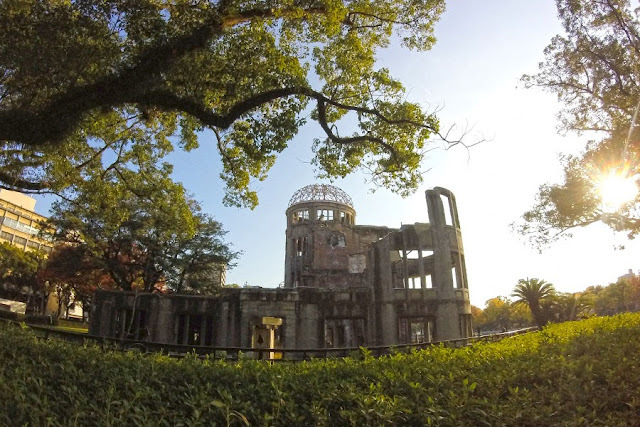 At 8:15AM on that day, the city of Hiroshima was completely destroyed and hundreds of thousands of people were killed. Today, more than 70 years since that horrific day, Hiroshima is a bustling city that has long since risen from the ashes. 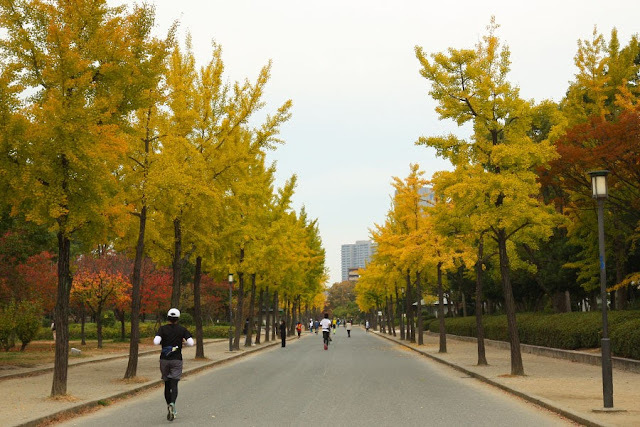 But not without reminding the world of its past and the hope for world peace with its 120,000 square meter Peace Memorial Park 平和記念公園 found in the heart of the city. 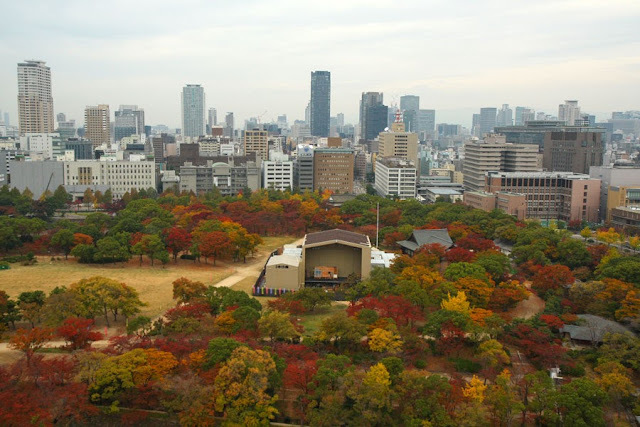 Within the park is the Genbaku Dome (A-Bomb Dome), a UNESCO World Heritage Site. 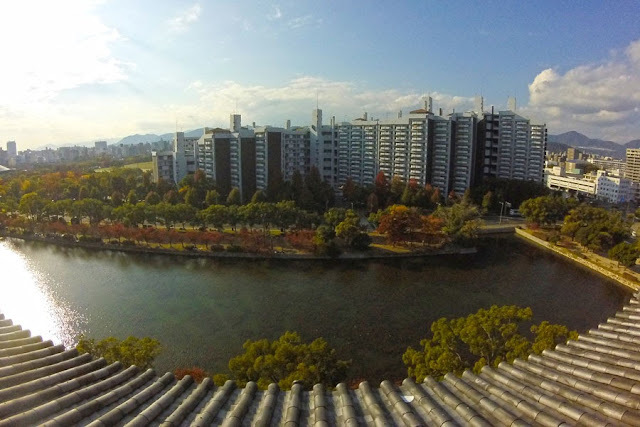 Just 160 meters from the hypocenter, the building that was the Hiroshima Prefectural Industrial Promotion Hall remained standing (albeit destroyed). The ruins remain in the same condition as it was immediately after the bombing. 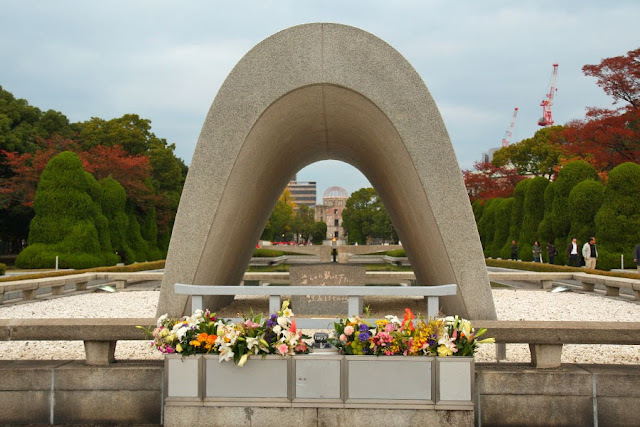 It stands to remind us of the destruction that humankind can create and to express hope for world peace, thus it is also called the Hiroshima Peace Memorial. Walking around the Peace Memorial Park was a time for reflection and prayer. In the park we saw the Children's Peace Monument, dedicated to all the children who died in the bombing. 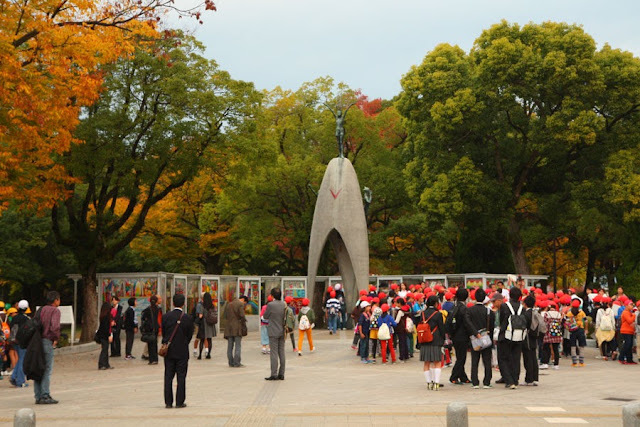 Thousands of paper cranes can be found around the monument as these are offered as symbols of peace. Sadako Sasaki was two years old during the bombing. It was only nine years later that she was diagnosed of leukemia. She kept on folding paper cranes in the hopes that it would help her recover. Her death, just eight months after the diagnosis, prompted her classmates to call for support in building a monument not only for her but for all the children who have died because of the nuclear bomb. That came into fruition as the Children's Peace Monument. From the Children's Peace Monument we walked towards the Peace Memorial Museum. We passed by the Flame of Peace, designed to look like hands opened towards the sky and pressed together at the wrist. It was first lit in August 1, 1964 and has continuously burned since. The fire will keep on burning until the day all the world gets rid of its nuclear weapons. Across the Flame of Peace, before we reached the museum, we stopped by the Cenotaph for the A-bomb Victims. The stone chamber sheltered by the arch of the Cenotaph is inscribed with this prayer: "Let all the souls here rest in peace for we shall not repeat the evil." The stone chamber also holds the registry containing almost 300,000 names of those who died from the bombing, regardless of nationality. By the time we reached the Peace Memorial Museum, it was already closed. If it had been open, I am not sure we'd have the strength to go in and look through the artifacts and personal belongings of the victims, let alone watch video testimonies of survivors. While we were wandering around the Peace Memorial Park in a somber mood, hunger struck and my friend suggested we try okonomiyaki, a pancake (looks more like an omelette to me) made of cabbage, eggs, pork or seafood (or both), topped with sweet sauce, mayonnaise, seaweed, and fish flakes. 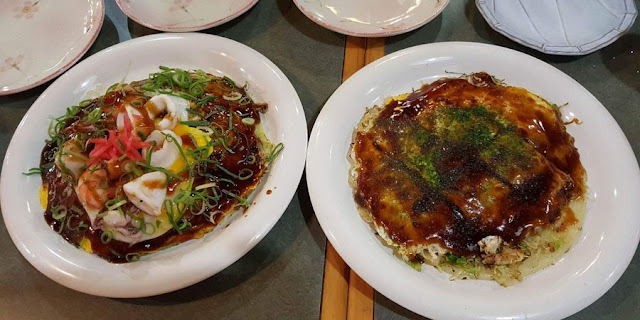 A debate started about okonomiyaki's place of origin: I read somewhere that it originated in Osaka, my friend insisted that it originated in Hiroshima. Osaka. Hiroshima. Food is food and we were hungry so we set out to find a place that serves okonomiyaki. 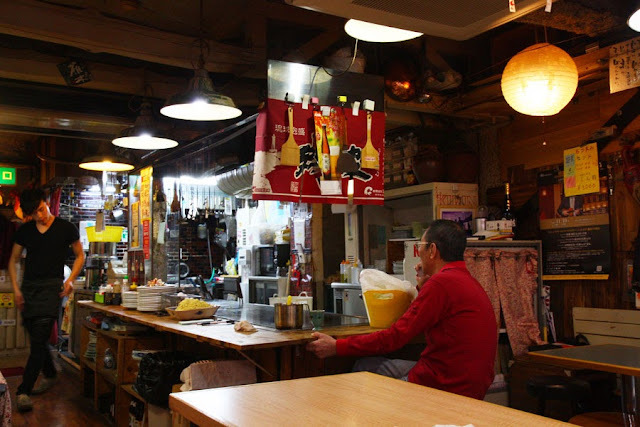 There is actually a cluster of okonomiyaki restaurants in an area called Okonomimura ("Okonomiyaki Village") just a 10-minute walk from where we were but we were too hungry (and too lazy) to go there. 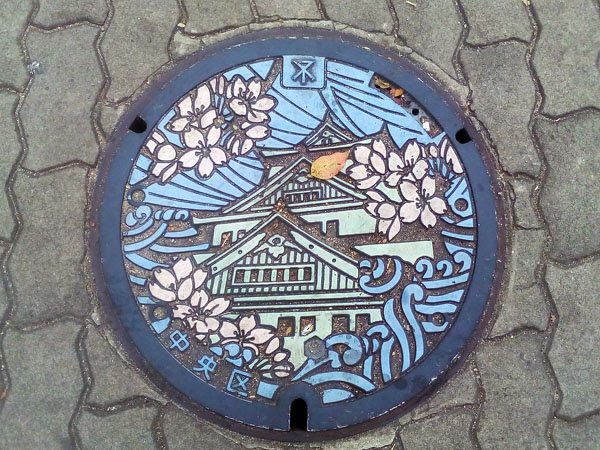 Instead we looked for one at Hon Dori (Hon Street) near Genbaku Dome. We didn't venture too far and found one on the second floor of a narrow building. The name of the restaurant was in Japanese but we knew it to be an okonomiyaki restaurant thanks to the photos of okonomiyaki that adorned the signage. What's the lesson here? It doesn't really matter where it originated. 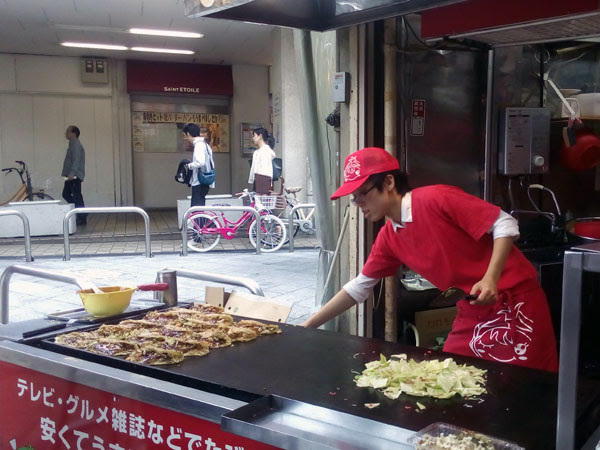 Just try okonomiyaki in Hiroshima and in Osaka as these two have different styles of okonomiyaki. 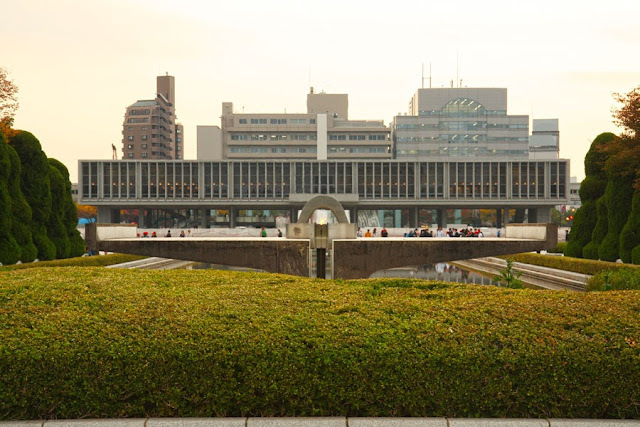 Getting around Hiroshima City: We went around the city using the Hiroshima Sightseeing Loop Bus. 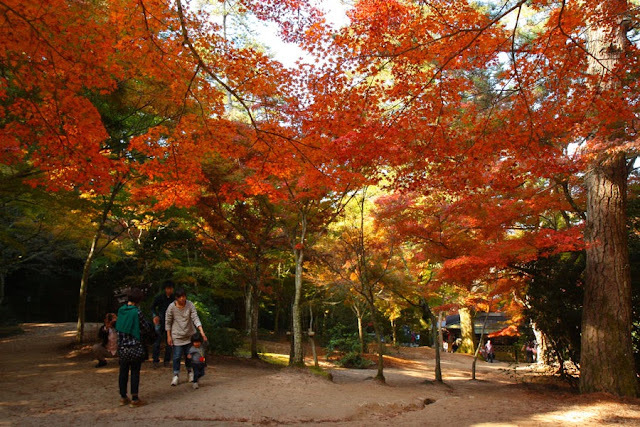 The sightseeing bus stops by the above spots and more (Toshogu Shrine, Shukkein-en Garden, and several art museums). The Hiroshima Sightseeing Loop Bus is operated by JR, thus the JR Pass is valid for unlimited rides on the bus. Otherwise, buy a one day pass for 400 yen, or pay individual fare (200 yen per ride). 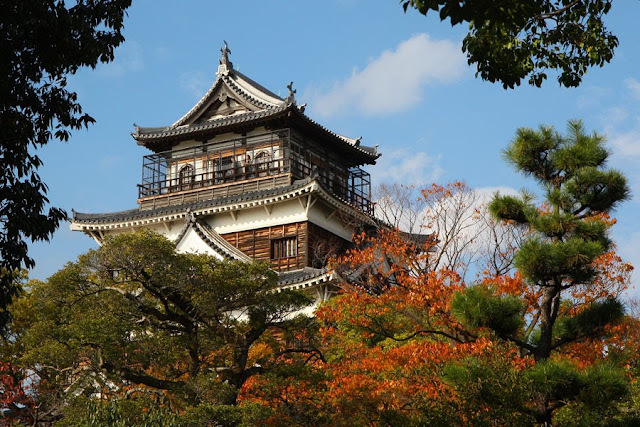 For our last three days (of our ten days) in Japan, our home base was Osaka, but we opted to do day trips from there to other prefectures, intending to make the most of our JR Pass. 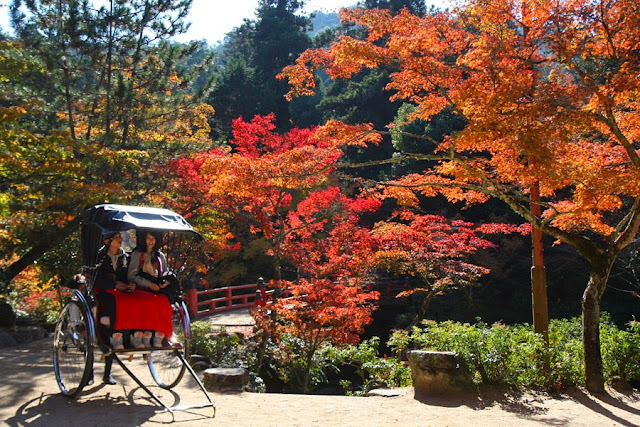 The eighth day was spent in Himeji City in Hyogo Prefecture, less than a 100 km west of Osaka. 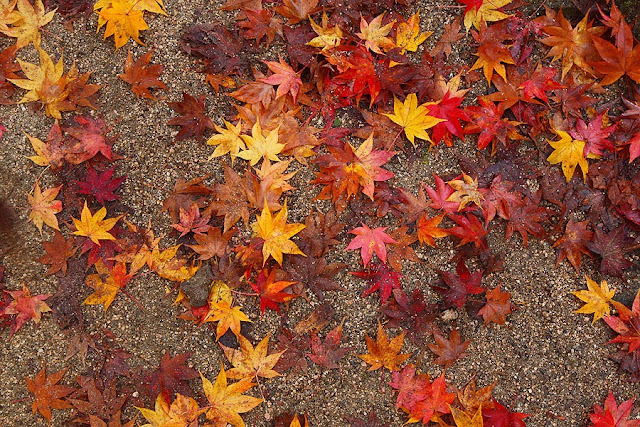 And the ninth day was spent farther away, at the prefecture of Hiroshima, about 350 km west of Osaka. 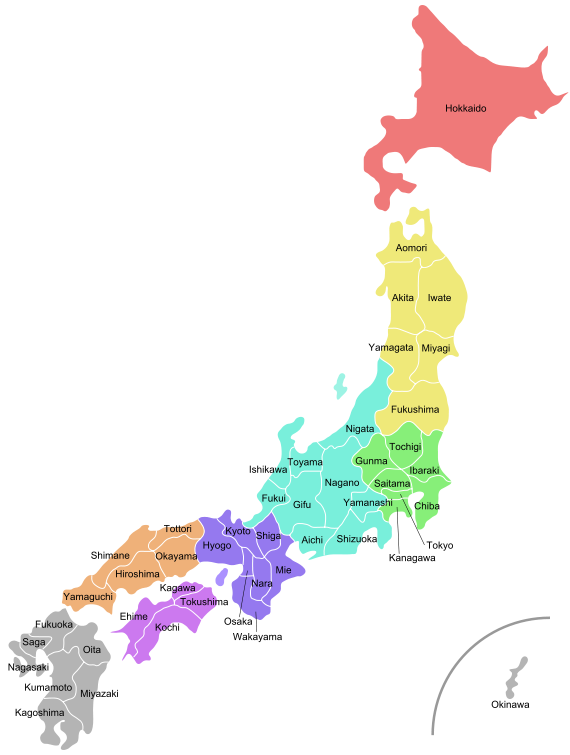 With access to the shinkansen, these prefectures didn't seem all that far. But 10 hours or so to spend in one prefecture, is it even enough? 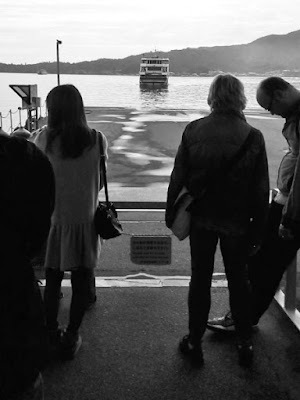 Way too short no doubt, so we picked just a few places to visit in Hiroshima and one of these is the island of Itsukushima aka Miyajima 宮島. 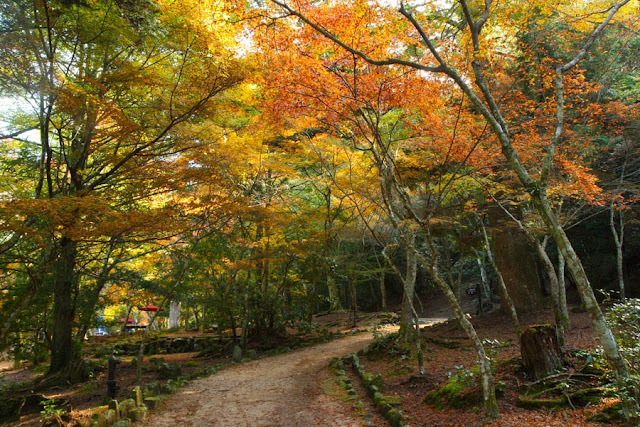 Directions to Miyajima: From Hiroshima Station, take the JR Sanyo line to Miyajimaguchi Station (25 minutes, 410 yen). 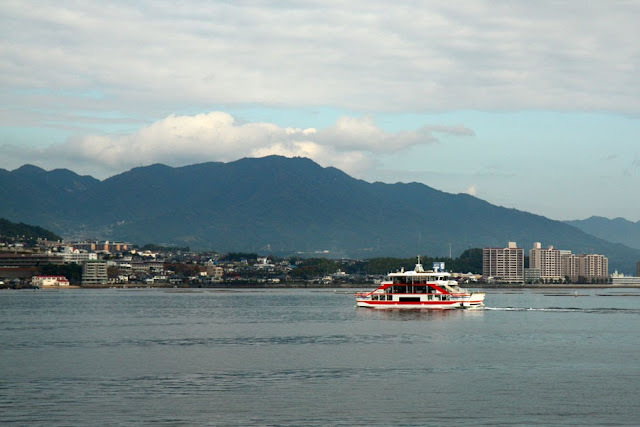 From Miyajimaguchi Station, walk to the pier, and take the JR ferry or Matsudai ferry to Miyajima (10 minutes, 180 yen). A cheaper (but slower) alternative from Hiroshima Station to Miyajimaguchi Station is to take tram line number 2 (260 yen). 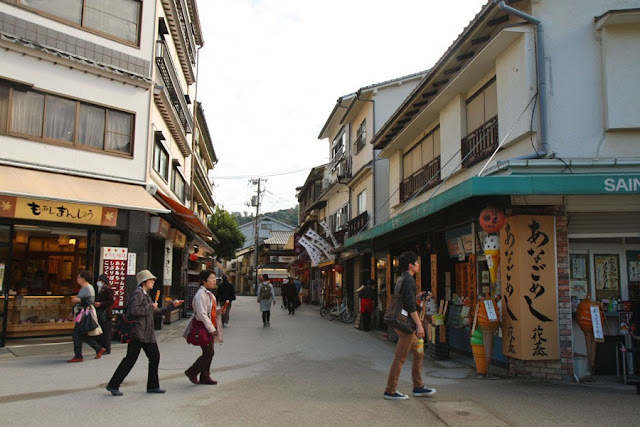 We explored Miyajima on foot. From the pier we walked past the town (we spent more time there on the way back), towards the well known Otorii (great torii) of Itsukushima Jinja 厳島神社 (Itsukushima Shrine). 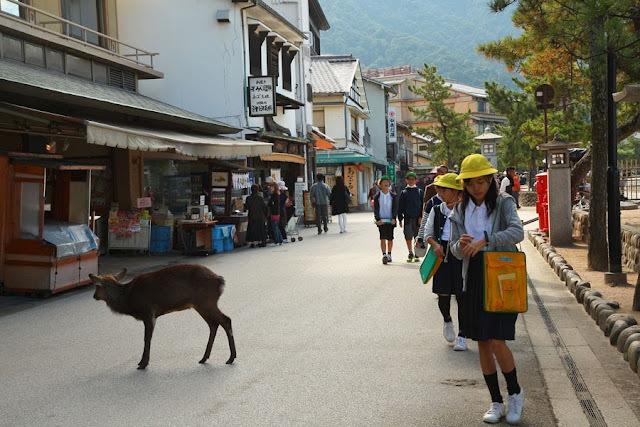 On the walk to Itsukushima, we encountered deer freely roaming the streets. 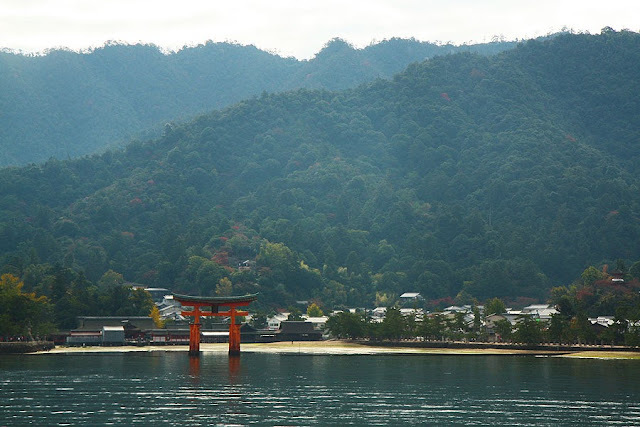 Itsukushima Shrine is a UNESCO World Heritage Site, and like its famous giant torii, is built over water. During high tide, the shrine and its torii look like it's floating on water. 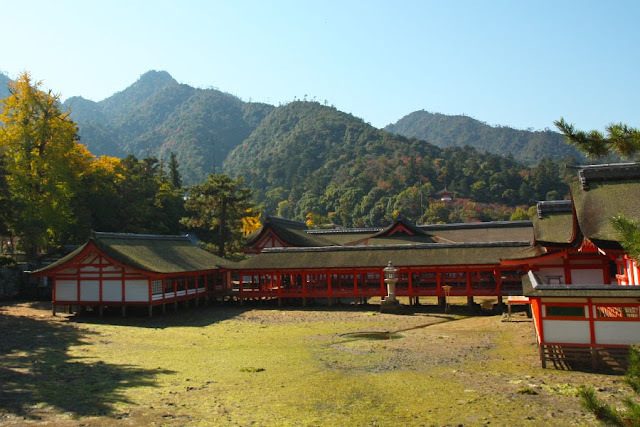 Itsukushima Shrine is said to have been built in the year 593. It has undergone many a restoration due to damage from fire, typhoon, etc. We did not visit the shrine itself, but contented ourselves with admiring the shrine's huge torii from the sidelines. 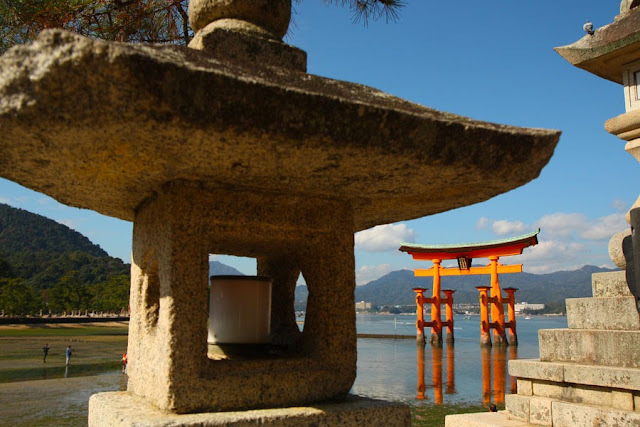 Itsukushima Shrine's first torii was built in 1168. The great torii standing now is already the eighth, built in 1875. It was low tide when we visited, but not low enough to walk towards the Otorii and not get our shoes wet. 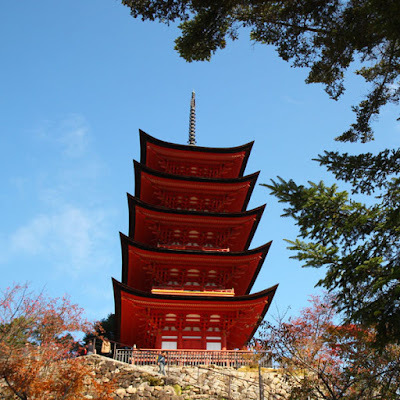 On the other side of the street from Itsukushima Shrine, Toyokuni Shrine's Senjokaku Hall and Gojunoto, its five-storied pagoda, caught our attention. Senjokaku which literally means "pavilion of 1000 mats," was named so because the size of the hall is approximately 1000 tatami mats (one tatami mat is 85.5 cm by 179 cm). The hall was built in 1587 and has remained unfinished. Gojunoto is older than the hall, having been built in 1407. 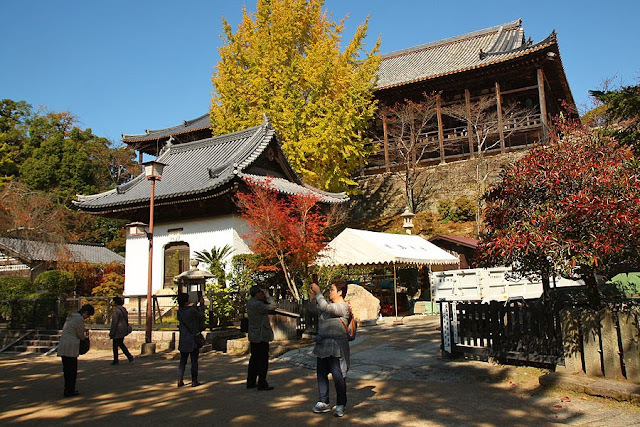 From both shrines, we continued walking inland towards Momijidani Park. The park has 200 maple trees and because it was autumn (and because I am a sucker for the warm colors of autumn leaves) we simply had to go! 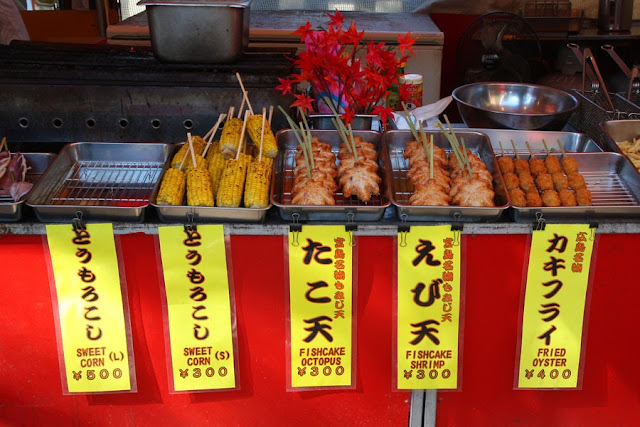 While walking around Miyajima, our mouths watered every time we came across food stalls. 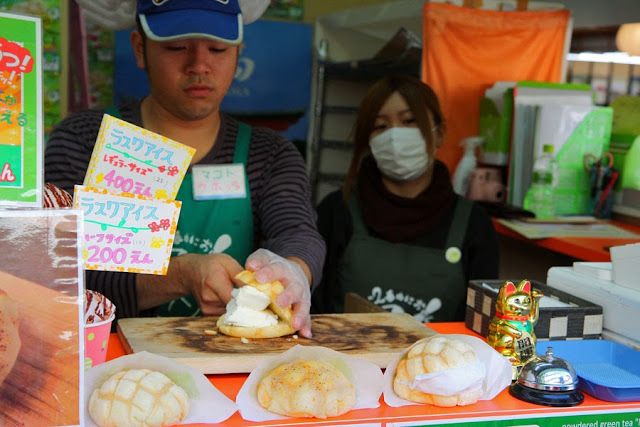 My friend who could eat melon pan every day was ecstatic to find melon pan stuffed with ice cream. My two other friends couldn't resist trying the fishcake because of its maple shape. And baked sweet potato ice cream? 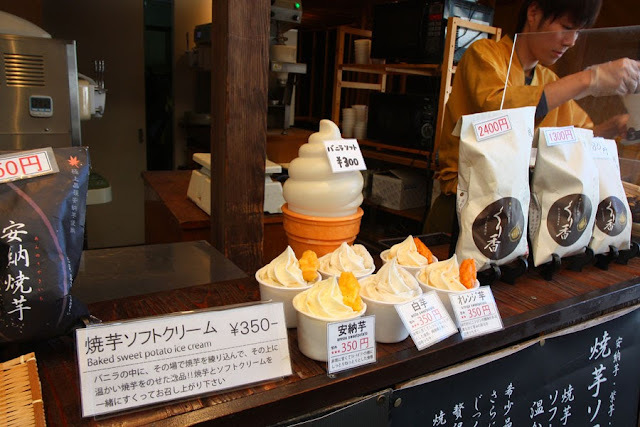 Sweet potato and ice cream?! I had to satisfy my curiosity!!! Before we knew it our half a day was already over and we have seen only a small portion of Miyajima. 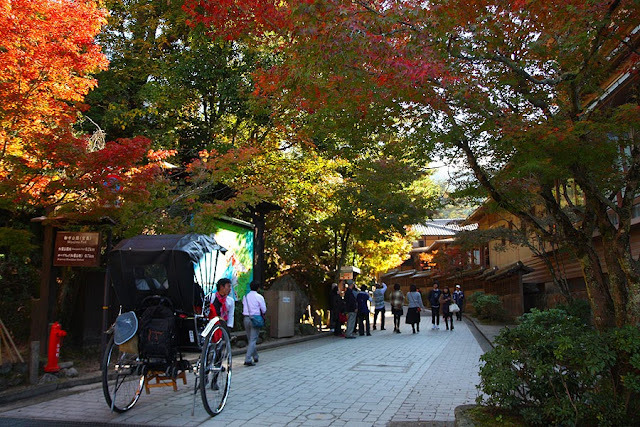 There was still so much to do: a mountain to climb, temples and shrines and museums to visit, and streets to get lost in. 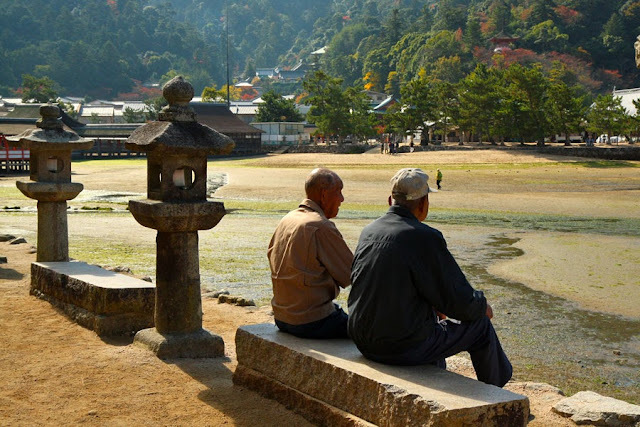 Next time (hopefully there will be a next time), I should spend an entire day in Miyajima. Japanecdote: Am I an Alien?